Several years ago, the Female Re-Enactors of Distinction (FREED) formed as an educational auxiliary organization within the African American Civil War Museum. Our mission to share the courageous accomplishments of the United States Colored Troops (USCT) is achieved through portrayals of women who made significant contributions toward the fight for freedom during the Civil War era. The FREED ladies accept numerous invitations to perform at schools, libraries, churches, historic events and conferences, locally as well as in other States, without seeking compensation for appearances. On behalf of all of our ladies, I would like to invite you to join us for our first Civil War Contraband Ball on Saturday, September 26th, 2009 from 5:00 to 8:00 PM at the Charles Sumner School Museum and Archives, located at 1201 17th Street, N.W., Washington, DC 20036. In addition to experiencing an enjoyable evening, you will be a tremendous encouragement to FREED as we endeavor to bring to life many of America’s forgotten citizens and their invaluable contributions in order that our next generation of leaders may be encouraged to set goals for their lives which honor the foundations laid by their ancestors. Please find enclosed an informational flier to review as you consider joining us for this historic event. It will be an evening you will never forget!!! 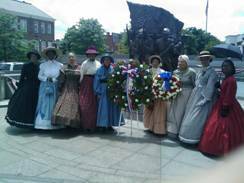 Female RE-Enactors of Distinction (FREED), an auxiliary group, established under the African American Civil War Memorial and Museum, is committed to accurately depict the role of African Americans, including the U.S. Colored Troops and their families during the U.S. Civil War.